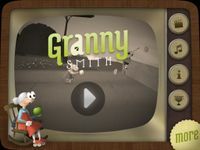 Granny Smith is an autorunning, parkour style platformer for the iPad. One button allows the player to do forward flips (holding it down allows for precise control over Granny Smith's orientation as she lands the jump). Another button lets Granny use her cane to zipline across power cables etc. The game is most similar in Gameplay to the late 2011 release, Wind-up Knight.